For Olivia Pope and Associates, cleaning up other people's messes takes a shattering personal toll. Season Two blows the lid off Quinn's identity, exposes Huck's dark past, and uncovers Olivia's darkest secret - something so shocking and enormous that it threatens the entire nation. From boardrooms to bedrooms, relive all 22 episodes of the explosive second season. Synopsis: Experience every breathless, jaw-dropping moment as Olivia Pope and her team of "gladiators in suits" turn up the heat and raise the stakes in Scandal: The Complete Second Season . For Olivia Pope and Associates, cleaning up other people's messes takes a shattering personal toll. Season Two blows the lid off Quinn's identity, exposes Huck's dark past, and uncovers Olivia's darkest secret - something so shocking and enormous that it threatens the entire nation. 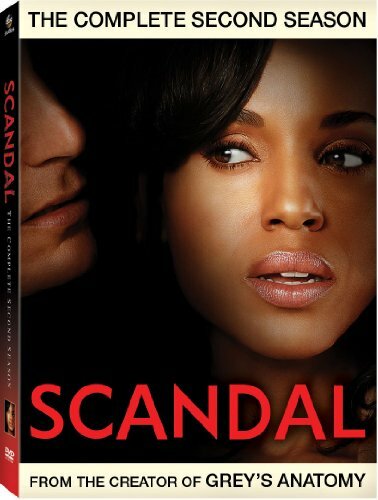 From boardrooms to bedrooms, relive all 22 episodes of the explosive second season of Scandal including exclusive, never-before-seen bonus features with this riveting 5-disc set. Talent/Cast: Scandal stars Kerry Washington as Olivia Pope, Columbus Short as Harrison Wright, Guillermo Diaz as Huck, Darby Stanchfield as Abby Whelan, Katie Lowes as Quinn Perkins, Tony Goldwyn as President Fitzgerald Grant, Jeff Perry as Cyrus Beene, Bellamy Young as Mellie Grant and Joshua Malina as David Rosen. A Closer Look: President Grant's Assassination Attempt - Get an inside peek at how one of Season Two's most pivotal scenes was shot (pun intended). Hanging with Huck - Spend the day with actor Guillermo Diaz and get to know the man behind the eclectic yet oddball character "Huck". Extended Episode - Delve deeper into the drama with an episode featuring additional moments too revealing for broadcast television. Deleted Scenes - Discover more scandalous secrets through several never-before-seen moments from the hit series. Outtakes - Fans will laugh out loud at these funny, unseen moments from the set of "Scandal.